Given the number of athletes who turned their eyes upwards, threw themselves downwards, crossed and prostrated themselves during these last two weeks of Olympic mania, one would imagine that God had been extremely busy meting out biblical justice. I watched with curiosity as nervous competitors, invoked higher powers prior to each leap, chuck or plunge. I was fascinated by the number who collapsed over the finishing line manifesting religious gratitude before seizing the national flag for a more temporal thanksgiving. I know I only saw all this because of camera close ups and I wasn’t glued to my television screen for 2 weeks so my observations won’t stand up to any statistical challenge. 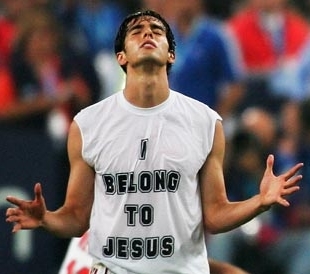 It is interesting though that at the height of their physical prowess a good number of athletes chose to acknowledge their religious affiliation. It isn’t as though they got to compete through divine intervention, however. These sportsmen and women put their natural talents and love of sport into the hands of coaches and trainers who molded them into Olympic material over four years of relentless training schedules and endless competitions. Why call upon God at the 11th hour? Of course the crossing of the chest may just be a nervous tic as much as the dropping of the forehead to the ground may be a loss of balance and have nothing to do with God at all. Then again it might point more to superstitious ritual with closer links to compulsive obsessive behavior than to an intimate relationship with God. However I choose to interpret the behavior, I can understand the joy that an athlete must feel standing on the dais sporting a gold medal – his reward for 4 years of hard work and self sacrifice. It would be churlish not to thank someone. Why not God? It is true that the original games held at Olympia in ancient Greece were in honor of Zeus and it may well be, that athletes attributed their success to the sacred nature of the time and place. Who knows what they did to themselves prior to throwing a discus or running a marathon; or what happened when winning conferred godlike status upon them? But that was back when Zeus was head honcho and it was OK to worship God in a multitude of forms. Today we have got ourselves into this silly situation of having three major monotheist religions each born out of the other and each divided from within. Each breeds partisanship and each is linked to a culture or a nation. The modern version of an Olympiad unifies us in our dedication to competition, our worship of winners and our prostration before the altar of success. But what has God got to do with all that? I know athletes seek that state of Grace called “The Zone” when they perform. It is a space of effortlessness and timelessness; of rhythm and harmony. They know when they have hit it and, if they have known this state, they also know when it is eluding them. I cannot vouch for the state of mind of those who crossed the finishing lines first but it may well be that they were attributing their victories to a state of Grace that knows neither nation nor denomination. And if that were the case I imagine that neither Grace nor God would have been fussy about the shape the athlete chose to give to his gratitude. It is just me, the spectator, who is bothered by what looks like from the outside, a clash of muscle power between Islam and Catholicism. Even if it is only a question of lucky charm worship, the signs are too richly connoted to be ignored completely. I have possibly lived in France for too long where religion is devoutly separated from the State and faith has been removed by and large from the public arena. I believe deeply and sincerely in the symbiotic relationship between humankind and God but tend to think of it as a private affair. And should Grace breathe Her timeless beauty into my mortal soul I too shall bow down in exquisite gratitude.